Categorically, I can state that the current situation of the country Nigeria has become so deteriorating and derogated that those gullible Nigerians clamouring for one Nigeria has become so deranged to the extent that they don't understand what it means to be living with an impostor as the president of their country. What a shame to most of them that are still in denial that they refused to realize the truth and face their fears of what is happening in the country right now. 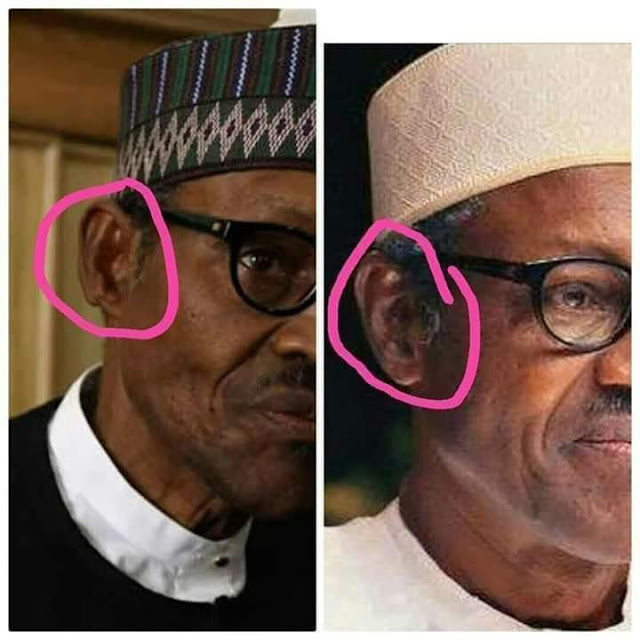 Left Picture is late Buhari, Right picture Jubrin the imposter in Aso Rock. Significantly, I can possibly state that the zoo Nigeria is being governed right now by an impostor from Sudan impersonating as former president Mohammed Buhari which in the actual sense is dead and buried in Saudi Arabia while some individuals parading themselves as Nigerians pretends not to be aware of it. Is it not obvious that Nigerians are now living a life in infamy? A country where you can't differentiate between who is your president and who is not, however, deceived by the so called leaders. Nigerians must wake up from their slumber because their so called country Nigeria is damned and can never be revived. Nigerians have allowed themselves to be deranged by those perverts known as the cabals in Aso Rock. The president Muhammadu Buhari that I know would have been to London for a checkup unlike this very president Buhari who is yet to go for medical check up since he resumed office as an impersonating president. The sudden silent and inactiveness of Zahra Buhari the daughter of the late Muhammedu on Twitter and other social media from Aso Rock is another thing to worry about. If there are still people who reason properly as Nigerians, I was hoping that by now, the streets would have been beautified with play cards bearing inspirations like "WE WANT TO SEE OUR PRESIDENT" "WHERE IS OUR PRESIDENT" "WE DON'T NEED AN IMPOSTOR AS PRESIDENT" so on and so forth. Believe it or not, if President Muhammadu Buhari is still alive, he would come out and address the Nigerian Citizens and equally defend himself from all these he will be calling Allegations against him, especially by Mazi Nnamdi Kanu Those clamouring for one Nigeria and those gullible Biafrans that failed to understand the truth even when the truth is staring at them eyeball to eyeball are all elusive of their ignorance and has wreak havoc on themselves and the society. This is the right time for Biafrans and people of goodwill who have lost hope on the Nigerian government to come. together with IPOB and their leader Mazi Nnamdi Kanu in making Biafra a reality and a dream come true for our unborn children and generation to come than being envious of Mazi Nnamdi Kanu. The better chance to bring Nigeria to her knees is here and it must be carefully managed. Blaming and castigating Nnamdi Kanu will never change the fact that Nigeria has been swallowed up by the ocean.